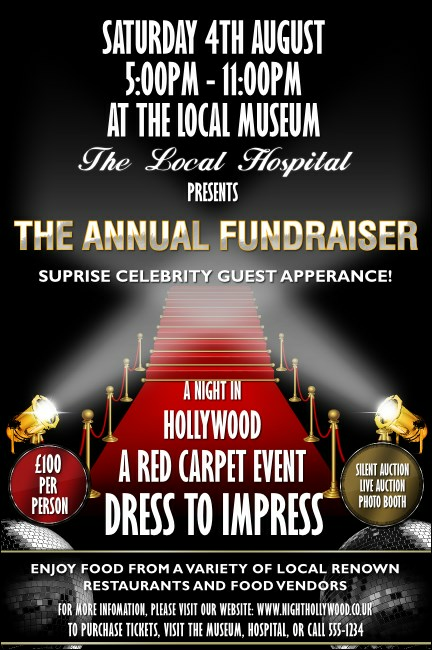 Evoke the paparazzi's flash and red carpet excitement for your fundraiser. Add Hollywood Lights Posters to your publicity plan. Velvet ropes, spotlights, and film-inspired typeface give your event’s details a glamorous air. One look and viewers will be ready to buy tickets! Tailor it to your needs in minutes—we’ll custom print and ship fast. Shop hundreds of themed, easy-to-personalise poster templates on UKTicketPrinting.co.uk.